Black Light Express (2017) is Philip Reeve’s just-as-good-as-the-first-book follow up to Railhead, continuing the exhilarating romp while expanding the universe and its inhabitants, as well as digging a bit more deeply into the hidden history of the created world and offering up some more page time to some of the first book’s secondary characters. Warning: there will be some inevitable spoilers for book one (you can just stop here with the take-away that I recommend the duology). First spoiler begins in the very next line! So at the end of Railhead, Nova and Zen had opened a gate to a whole other set of worlds, these inhabited by an inventively wide assortment of alien species. Taking on the role of “ambassadors” (being unwilling to admit they can’t go back to their own worlds due to being fugitives, and thanks to the gate they used being destroyed), the two travel around as traders, giving Reeve the opportunity to show off his alien-creation skills. As they travel, they learn of a horrific cataclysm called the “Blackout,” which seemingly led to the destruction of the race that created the rails and gates. It’s a taboo subject amongst the aliens, but solving the mystery of the Blackout, or at least exploring it, may lead, Nova believes, to a way home for the two of them. Unfortunately, to do so they’ll have to find a way around an aggressive reptilian species that is after Nova for what she might teach them about advanced technology. Meanwhile, back in the human-dominated part of the universe, things aren’t going so well with the ruling family, and thanks to the ongoing political turmoil, we get to spend a lot more time with Empress Threnody, as well as her current handmaiden-former criminal Chandni (a seemingly throw-away character from book one). We also revisit Threnody’s former fiancée Kobi, who finds hidden depths that were hinted at a bit in the first book, and Zen’s sister’s friend Flex, who also grows in complexity here. In fact, these two minor characters from the first book have some of the most moving moments here in Black Light Express. One of my favorite aspects of the sequel is that Reeve didn’t play it safe by focusing on the two main characters but is happy to leave them behind for long stretches to let others have the stage. In general, characters here are also nicely complicated, with “good” characters often frustrating readers hoping for a bit more solidly steady sense of ethics. And as with the first book, the cast of characters is not limited to the organic, as one of the most enjoyable characters is Ghost Wolf, though we meet several other trains with strong personalities as well. 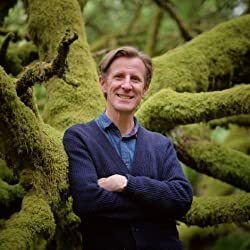 As one expects by now with a Reeve novel, the plot zips along via clear prose, though Reeve gives us a bit more description, having opened up a whole new “Web of Worlds” filled with wonderfully non-human species. The concepts as well as the geography are bigger, and we learn much more about the creation of the gates, the role of the Guardians, and why the gates have remained a mystery for so long. Meanwhile, Reeve continues to explore issues of identity and humanity, AI, the impact of technology, and the safety of stagnation versus the dangerous benefits of growth. Speaking of danger, Reeve isn’t averse to killing off major characters, and there are several wrenching moments (some involving death; some not), including a painfully bittersweet ending that is all the better for being pretty inevitable from the start. Inventive, taut, quick moving, with the ability to move you or make you uncomfortable at any given moment, Black Light Express brings the story begun in Railhead to a strong close, though I’d be more than happy if Reeve found a way to return to this universe for more stories. Short version: What Bill said. 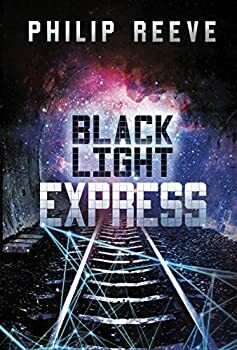 Slightly longer version: Black Light Express is a great sequel to Railhead, continuing everything that I enjoyed about the first book while expanding on the character- and world-building that make this duology so interesting. Though the pace seems to slow a little while Zen and Nova are in the Web of Worlds, especially in comparison to the flight-for-their-lives Threnody and Chandni are caught up in, their two storylines come together in a satisfactory way. I liked the character work in Black Light Express because there were unexpected developments for each of the primary characters, and the secondary characters added depth and interest far beyond providing impetus for the plot. Though some resolutions felt a little inevitable, they still came across as the logical and best endings, and were no less poignant — especially because of the way the characters react to their changing circumstances. Introducing the Web of Worlds and the Black Light Zone was, as Bill says, as good way for Reeve to show off his imagination and explore possibilities for different types of life that might be seeded throughout the universe. I’d been curious as to how a lot of this technology and humanity’s migration from Earth came about, and Reeve supplies absolutely satisfactory answers to those questions, along with leaving the way clear for further exploration should he choose to expand this universe beyond the RAILHEAD duology. (Which I definitely hope he does!) This is a great space-exploration duology, as well as a smart examination of individual identity, self-determination vs. predestination, and personal morality/ethics. Railhead and Black Light Express might be marketed toward YA readers, but there’s plenty for adults to enjoy as well. Highly recommended. Publication date: August 1, 2017. With superb world building, gripping action, and ruthless political intrigue, Black Light Express delivers a breathtaking adventure into the darkest depths of space and is sure to please sci-fi fans and foes alike. At the edge of the Great Network, a small-time thief and an android girl ride aboard a sentient train. They hurtle toward the unknown, ready to see what lies beyond the end of the universe. But Zen Starling and Nova leave behind worlds on the brink of chaos. Old rulers are dead, and now young Threnody Noon sits precariously on the throne. Unrest spreads like a virus, a rival corporate family grows hungry for power, and the once tranquil Empire seems bound for railwar and ruin. Watching everything are the Guardians–the mysterious god-like AIs to whom people of the Network offer their prayers and praises. But even gods have secrets. Secrets the so-called benevolent deities would do anything to keep hidden deep within the farthest reaches of existence. 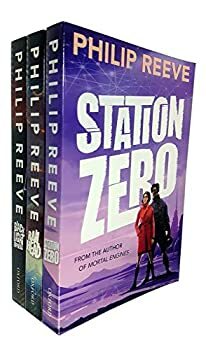 Return to the exciting sci-fi world of Philip Reeve in this sequel to Railhead, which received three starred reviews and was praised by Publishers Weekly as a thrilling and imaginative escapade.